It really began a long time ago – I was a college student when it happened, sitting around with a group of colleagues, when (with blood glucose levels falling as the evening wore on) the conversation not unnaturally turned to food. What sort of grub did one like? Were there some sorts of food that no-one could possible abide? I distinctly recall that pikelets, toasted before the fire, were roundly condemned as old women’s fare. Equally scathing was the view of trotters, tripe, giblets and offal, though no-one would confess to ever having tasted any of them. And then it was that someone said: “Have you ever tried sardines with jam?” With that preposterous idea, he brought the house down. Some shuddered. Others laughed out loud, and then we gave up and went off to eat unadventurously across the road. But the story of the sardines and jam went around the college next day, then around my family at home, then around an ever widening circle. It was on the way to becoming a legend of sorts. Until, that is, that day many years later when I found myself sitting at a well-stocked party table on which, among things, both raspberry jam and sardines in olive oil featured. The legend had to be put to the test; this was a challenge too tempting to ignore. 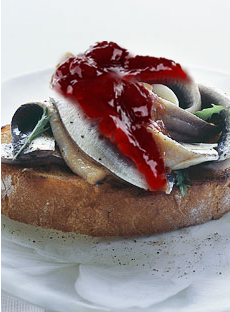 Hesitantly, I took both jam and sardines on a slice of buttered bread. And then on another slice. And then, after ensuring that no-one was looking at me, on a third. Since then it has remained a favourite component of my diet, though I confess to having found few converts to my taste. I think it does me good. Mind you, the jam must be red (I once tried orange marmalade and ended up faintly nauseated) and the sardines must have bathed in olive oil and not in tomato juice. There now, I have confessed. You should try it. No correspondence, if you please. I was unexpectedly reminded of this history some months back when I found myself sitting by invitation in a winter sports stadium observing a ski shooting race. You surely know this form of recreation; the contestants ski some way down a slope (or a mountain, if you have one handy), stop at a given point to take up a gun and shoot at a target, then ski off again and repeat the feat as often as the rules demand. It is the sardine and jam story all over again, you see – an unlikely combination of choices. Whether the skiing impairs the quality of the shooting or the shooting episodes improve the quality of the skiing or vice versa I shall never know, nor is it clear to me how they judge the winners, but they all appear to enjoy themselves hugely, and if I were sixty years younger I might try it. Odd combinations of activities could prove uplifting to the spirit, I suspect, just as odd combinations of foods may prove uplifting to the most jaded of palates. But surely the principle is worth extending, if only for the novelty, and perhaps for much better reasons? What about parachuting and chess? Or wrestling combined with cricket? Or a swimming contest alternating with musical chairs? If variety is the spice of life, the principle clearly merits further development. I happen to know a company with a right-minded chairman, who, when the debates in the Board of Directors threaten to stall, is said to insist that all the members take off their jackets and race one another three times around the swimming pool. He asserts that there is nothing like it for reinvigorating corporate policy. Why not try that on the Cabinet? Or the European Commission? Or the Security Council? You see, I am now truly inspired, and I propose to do something about it. For the last three days I have been dreaming dreams of skis, swimming and sardines, but also of treadmills installed under office desks to provide current to the computers and boost their memories, and all hail to the nerd who sets the day’s megabyte record. Obviously, my ideas will need to be patented and copyrighted before I can proceed. But this is the way to get society throbbing again, and banish economic depression. Once I find the capital, I plan to set up an Academy of Alternating Activities, managed vigorously by Greyhares Enterprises. My first Course, which is still under wraps, will provide training in a procedure in which a competitive Mental Activity “A”, designated by myself, will alternate with a similarly designated and competitive Physical Activity “B”, ensuring that world records are attained in each field, to the benefit of all. You must not ask for more revelations at this stage, but I can release just one small detail: the needs of my Academy’s trainees will be well provided for in every respect. The Academy will be built around a swimming pool: there will be a boxing ring in the garden, a ski slope just beyond, and much more challenging surprises a little further away. There will be an enterprising chef in the kitchen, who knows precisely what it takes to feed champions. And in preparation for his arrival I am already stocking up on jam and sardines. All right, I’ll consider selling the film rights. But first I really want to know how you got the picture. Did you actually try jam and sardines? Did you enjoy it? No, no, that would be a sandwich too far; even for those of us with tastes as diverse as those in the Greyhares editorial office. Thanks to the wonders of digital manipulation, no palates were compromised – the jam was carefully ‘siphoned’ from one photo of a cream scone and squirted on top of another of a sardine open sandwich. But I might give it a try one day – would gooseberry or kiwi jam work I wonder? The place sounds idyllic Graham and many of us might even contemplate retiring there, at least to enjoy the exercise and the mountain air; even if some aspects of the catering make chalk and cheese sound like haute cuisine. I think you should also sell the film rights to Hollywood, following the success of films like Quartet and Best Exotic Marigold Hotel. Maggie Smith, Dame Judi, Billl Nighy and Dustin Hoffman have doubtless been approached already?